As we know deployment of wireless cellular systems are increasing due to increase in demand from users point of view. This leads to increase in number of base stations deployment supporting multiple wireless standards such as UMTS or CDMA, LTE, Wimax etc. In order to avoid installation of bulky base stations new concept of remote radio head (RRH) have been developed. In this concept, existing base station consisting of both baseband and radio functionalities have been divided into two components. This RRH components are referred as REC(Radio Equipment Control) and REs(Radio Equipments). REC consists of baseband functionalities and RE consists of RF and ADC/DAC functionalities. In this RRH architecture, both RE and REC will have layer-1 and layer-2 protocol layers. Below is the RRH frame structure used to carry signalling or information data. The link between REC and one or multiple REs is referred as CPRI link/links. Various topologies such as chain, ring or tree exist between them. CPRI link in RRH technology carry IQ information data,synchronization data, L1 inband protocol, C&M data and so on. The figure depicts CPRI frame structure. The RRH frame is made upto 10 ms duration with total 150 hyperframes. Here one hyperframe composed of total 256 basic RRH frames. Each RRH basic frame made of 16 words as mentioned with index W ranging from 0 to 15. The length of a basic CPRI frame is 1 Tc equal to 260.4 ns time duration(Index X). Tc = 1/Fc = 1/3.84e06 = 260.4 ns. 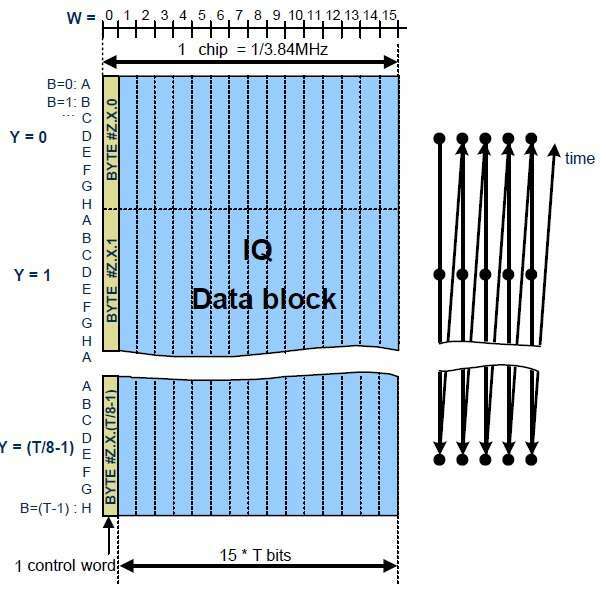 In a CPRI frame structure, out of 16 words 1 word is used for control word and rest of 15 words are used to carry user plane IQ data (SAPIQ). CPRI interface supports various line rates. Table below mentions CPRI line rates including length of words in bits and total information data bits carried by them. Here factor 15/16 accounts for 15 data words in total of 16 words. The factor 8/10 accounts for 8B10B encoding which refers to 80% is non encoded data and 20% redundant information is transmitted on CPRI line interface. Other than this CPRI frame structure one can refer frame structures of various wireless standards or technologies as mentioned below. Frame structure of various wireless standards/technologies are mentioned below. It include WiMAX, WLAN, Zigbee, GSM, GPRS, UMTS, LTE, TD-SCDMA, GPS, SDH, 11ac WLAN, AMPS, Ethernet, VLAN etc.